At each monthly meeting, members bring a printed photo (maximum longest side – 22″) of their choice to be entered in a competition where all attending members vote for their favorite “Photo of the Month”. The winning print is displayed in the Guild meeting room until the next meeting. It’s a fun competition for all. Another avenue for sharing your work during the monthly meetings is during our Photo Challenge. All images are copyrighted. Please do not copy, save, or reproduce in any way without explicit written permission. Thank you. CLICK ON PHOTOS TO ENLARGE. 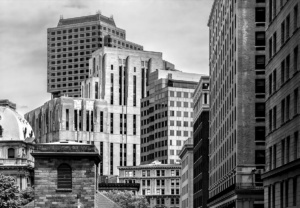 This photograph was taken in June 2018, while walking the streets of Boston, Massachusetts. I was drawn to the variety of shapes and levels of the buildings. 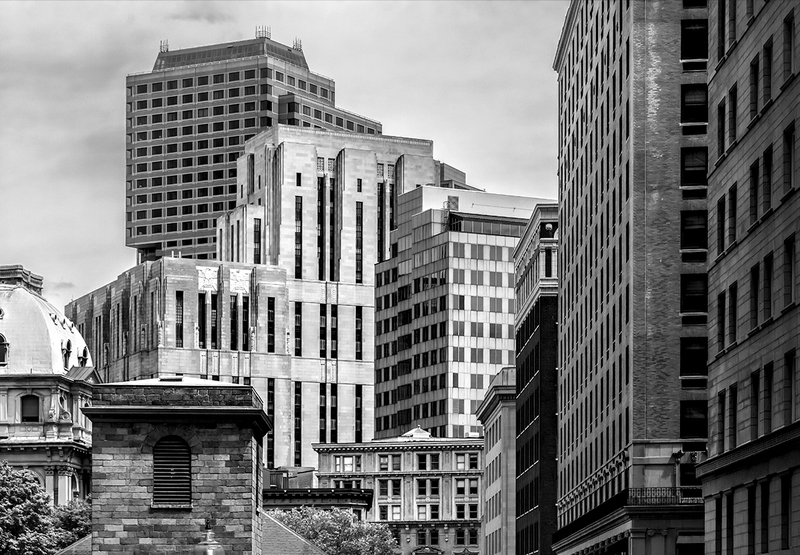 I decided to turn the photograph into black and white because I wanted the viewer to see the shapes, darks and lights of the buildings instead of the colors. 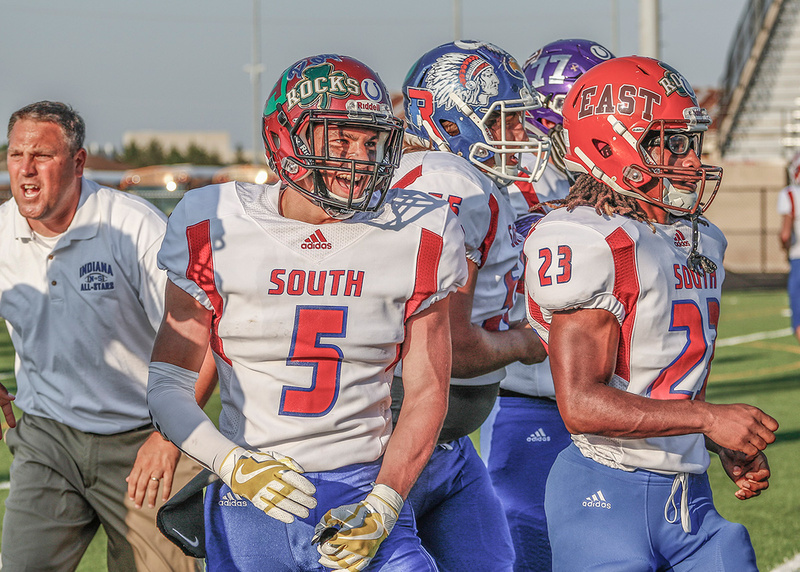 This picture was taken at the annual Indiana Football Coaches Association North-South All Star game. 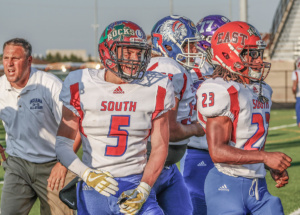 It is a game between the best just-graduated high school football players all over the state. It shows the emotions of a player who just scored a touchdown. The photo was taken at the recent annual Goshen Air Show, attended by about 30,000 people. 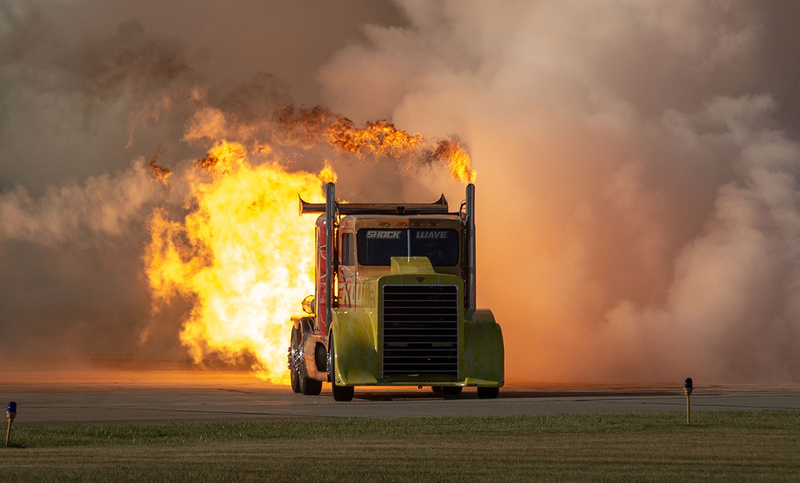 It included a demonstration by the 7 time winner of the National Air Acrobatics Contest, the V-21 Osprey, a woman wing walker on a biplane, a F-5 jet, and formation flying demonstrations. It is a great venue for photographers. I had thought about going up to Grand Rapids for their air show, but this one was pretty impressive. This photo was shot at 1,500th of a second, f5.6, ISO of 400 at 210mm. 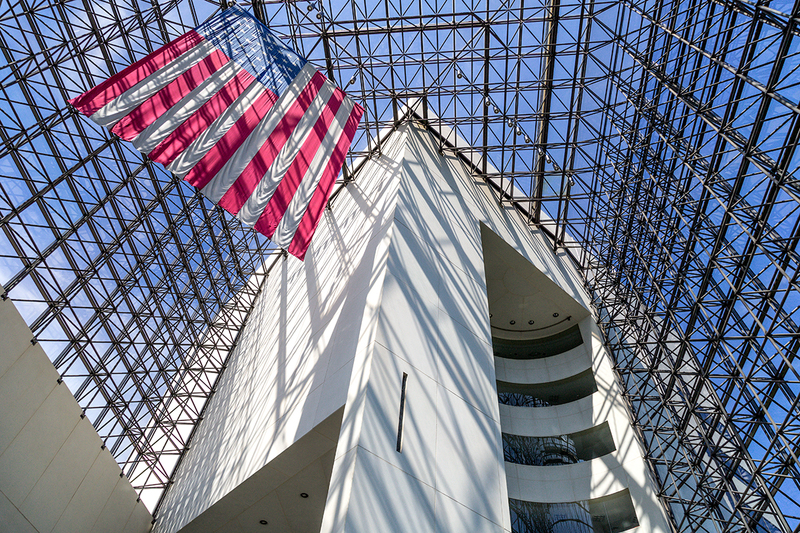 This photo was taken in June 2018, at the John F. Kennedy Presidential Library & Museum in Boston, Massachusetts. 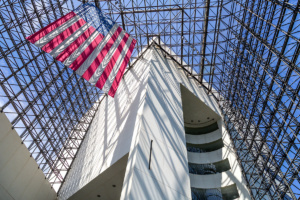 It was a wonderful building to photograph and I was especially inspired looking up at our American Flag hanging from the ceiling of this beautiful atrium, designed by Architect, I. M. Pei. 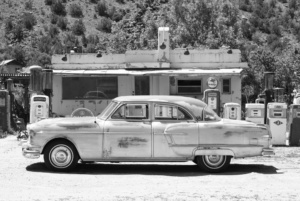 The photo was taken on a trip to New Mexico on I believe US 285. We were on our way from Santa Fe to Taos and literally came around a bend and there it was. I am literally standing on the edge of the road with quite a drop down to the rio grande. Taken with digital, nikon d7200 camera, 70-300 mm lens, 70mm focal length, f/16, ISO 200, 1/200 sec. April 2018 – Mike Goodwin and Kay Rhodes. 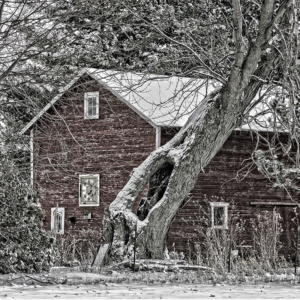 “Red Barn” by Mike Goodwin. Pulled over on the side of the road, rolled window down and took the shot. 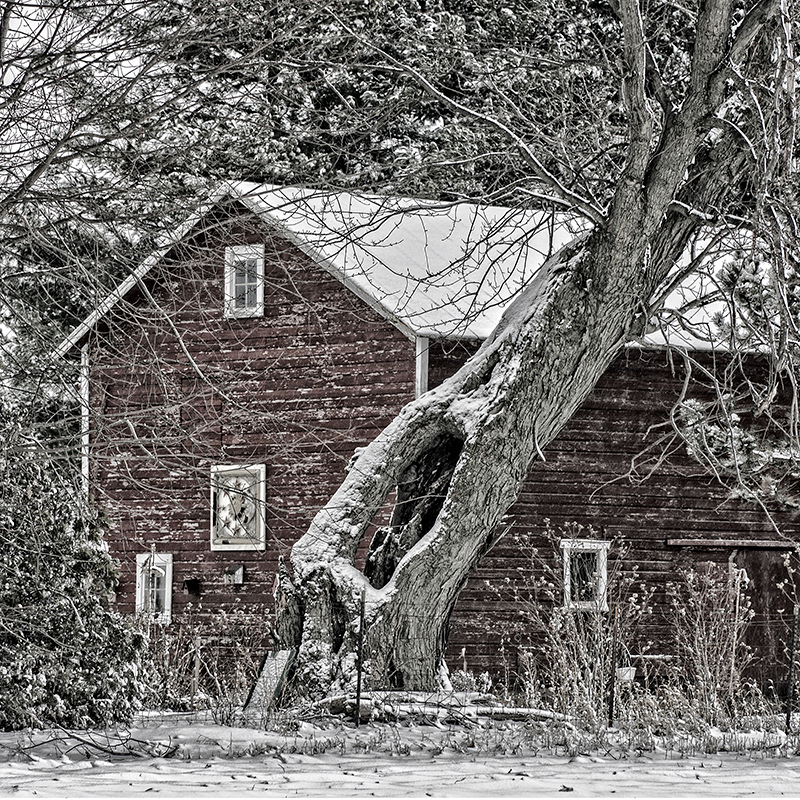 In Photoshop I desaturated the color image to give a monotone feel and down-play the very red barn. Camera Settings: F/8 @ 1/125th of a second. ISO 400. Image stabilized lens at 105mm. “Weathered Roots” by Kay Rhodes. 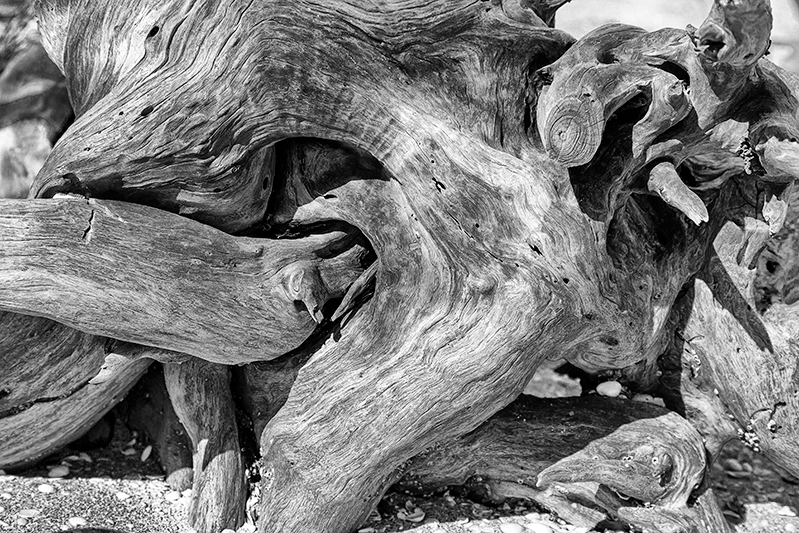 I discovered a beach full of weathered wood on Sanibel Island in Florida, this past February . I’m always drawn to texture in nature, and the roots caught my eye and seemed draw me in to take a photograph. Camera settings: Canon EOS 5D Mark III, 24-105mm lens, f/8, 1/500 sec shutter speed, ISO 250. 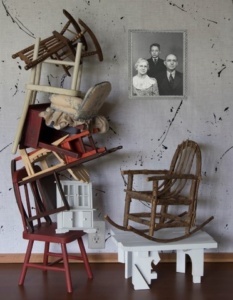 “All but two will fit in the closet” by Don Hershberger. What started out as a fairly straightforward photo of the model furniture against a plain background progressed to become a pieced together simulation of a wall in a house as the background with electrical outlet and a picture hung on it. “Wu in the Wild” by Joe Tinervia. This image was captured during the Guild’s outing in St. Joseph Michigan along the shore. You can see the Wen is walking along the edge of the metal seawall. 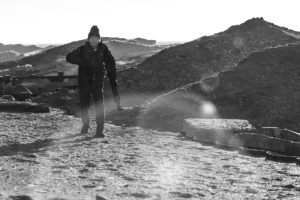 The hills in the background are actually ice formations with sand blown over them to give them that unique texture of an alien planet. I wanted to get him in silhouette with some lens flare so I ran over to get into position as he was walking along. I am happy with the resulting image. I shot this on a Canon 6d with my 70-200mm f/2.8 lens at 73mm, f/3.2, 1/1000sec ISO 100, +2 Exposure compensation set due to the strong back-lighting. I cropped, raised the contrast and clarity, adjusted overall exposure down a bit and lightened up the shadows and Wen’s face in Lightroom. Another avenue for sharing your work during the monthly meetings is our Photo Challenge. A topic for each month’s Photo Challenge is assigned and members are encouraged to go out during the weeks leading up to the next meeting and capture images that they feel best interpret the topic. At the meeting, the photos are then shared and friendly critique is offered to help the photographer recognize areas for improvement and/or what about the photo was done well. Read about the details and rules for submitting a photo. JANUARY – iPhoneography / point and shoot, simple Camera. FEBRUARY – Macro / Close up Photography. MARCH – Multiple exposure / compositing to create image. APRIL – Shooting up, down or Straight on. Same Image different angles. JULY – Motion Blur to add artistic effect. AUGUST – Long exposure approx. 1 sec or more. OCTOBER – Night Photography (if your adventurous light painting).